Don't miss this exceptional professional development opportunity to hear from an outstanding line-up of dynamic speakers with illuminating cultural perspectives. Register now and you can still go in the draw to win 1 of 4 complimentary places on our two day MentorPlus training workshop being held in Wellington (July) or Auckland (October) this year. Our joint opening address from Nathan Mikaere-Wallis, X-Factors Education, facilitating the application of neuroscience to youth practice and and Hana O'Regan the newly appointed General Manager of Oranga/ Wellbeing for Te Rūnanga o Ngāi Tahu, will explore the concept of Tuakana/Teina (peer support/mentoring). How does the concept of rakatirataka (leadership/excellence/role modelling) and cultural empowerment inform our understanding of the role of mentor and the concept of Tuakana/Teina? The morning panel will provide a full rundown on the newly published 2nd edition of the Guide to to Effective and Safe Practice in Youth Mentoring, to ensure you can immediately apply it in your daily work. Hear from Michael Moka, the young and engaging Founder of Indigenous Growth limited about 'hara taku toa I te toa takitahi - My success is not because of me alone' and he will share his story of being mentored. Anya Satyanand, CE of Ara Taiohi, the peak body for youth development in Aotearoa, will discuss the state of youth development in New Zealand in 2016 and will present international and national perspectives. Dave Richards, Projects and Strategy Manager at The Tindall Foundation will discuss The Foundation's approach to youth development funding and collaboration and share ideas for achieving long term sustainability. Dr Pat Bullen, Senior Lecturer in youth development at The University of Auckland will provide an overview of the youth mentoring research conducted in Aotearoa New Zealand to date, highlighting findings that both converge with and diverge from mentoring practice overseas. Murray Edridge, Deputy CE, Community Investment at MYD, will outline the government’s community investment approach and what this means for the youth sector. Our closing keynote speaker, Dr Karlo Mila, Pasifika poet, writer and researcher, will talk about ‘Opening our ears to ancestral mentors:' the importance for young Pasifika and Maori to have access to ancestors as mentors - to draw on and re-engage with ancestral knowledge, wisdom, language, worldviews, wellbeing constructs and proverbs - a treasure-house of somewhat marginalized ‘mentoring’ knowledge. 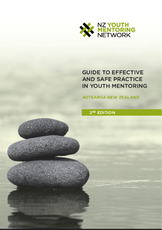 We are very much looking forward to sharing the newly published 2nd Edition of the Guide to Effective and Safe Practice in Youth Mentoring, Aotearoa New Zealand with you at the conference. We look forward to seeing many of you next Tuesday at the conference.